Spare the ribbon and spoil the book. It's strange how I feel as if I know people who comment on this blog and e mail me off blog even though we've never met, and I'm sure Curzon and I would probably agree on a lot of things. We are definitely in agreement about one omission. Curzon recently recommended The Morville Hours by Katherine Swift in words that were far too enticing for me to resist. Abracadabra and a sprinkling of oofle dust and the book arrived the next day. 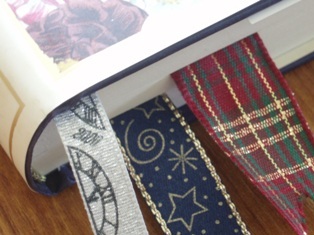 Every first edition hardback that arrives from Bloomsbury bears a ribbon bookmark, even cutting-edge contemporary fiction flaunts a ribbon, so if there was one book that Curzon and I agree could probably bear two if not three ribbons it is The Morville Hours. Perhaps this is the book with which Bloomsbury have decided we have all been unnecessarily spoilt because my copy is sadly bereft of a single silken addition. 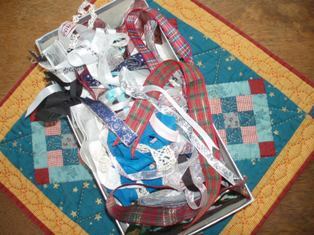 That said I had to trundle off and find some ribbons of my own. This being me, and all things being truly equal, it will come as no surprise to you to learn that I can't bring myself to throw a single piece of ribbon away ever because it might come in useful. There is peril ahead in my old age, I have the makings of a spectacular bag lady. The ribbon box is indeed a disgraceful portent of the chaos that could reign, but thanks to my magpie tendencies several pieces have emerged as clear front runners for The Morville Hours placement and have now been installed for the duration of the read and all eternity beyond. 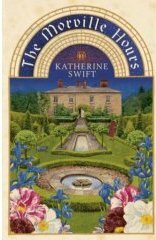 The book is a flawless and poetic journey alongside Katherine Swift as she transforms her Dower House garden into a restored paradise, and it is a book that somehow asks to be read in that monastic tradition of slow, diligent thoughtfulness. Katherine makes this much easier by shaping the book around the Hours of the Divine Office. The seven day hours together with Vigils the Night Office. Timings vary according to summer or winter but with Vigils at 2am, a time of study before Lauds perhaps three hours later, then Prime before work began. Three hours until Terce and on my day off, especially if it's raining and blowing a hoolie, the shame of it, I could still be in bed sipping tea and reading. Three hours later is Sext and the main meal of the day followed by None (rhymes with stone) and Vespers at sunset. Lastly Compline celebrated at 9pm.The writing is as perfect as you could wish for, rich and satisfying. This is writing that leaves a little indent of pleasure on your brain, even just a few sentences at a time and it all makes you examine your own little bit of earth in a new and refreshing light. We discovered in passing that the little Inn at our nearby ancient River Tamar crossing place into Cornwall was once a Nunnery and the bridge itself was built by French Benedictine monks in 1438, possibly at 5am in the morning. I'll take you for a walk down there tomorrow. I wonder, did the monks ever wander a few hundred yards across the fields in our direction? I'm only a fraction into this book but it's a book that will let me dream of something as fundamental as who has stood here, in this very spot, before me. Books with such power feel as rare and precious these days as an illuminated Book of Hours itself, a book that is a touchstone to something deeply intrinsic and within. More about The Morville Hours in the fullness of time.